From the publisher: "For Kelly Corrigan, family is everything. At thirty-six, she had a marriage that worked, two funny, active kids, and a weekly newspaper column. But even as a thriving adult, Kelly still saw herself as the daughter of garrulous Irish-American charmer George Corrigan. 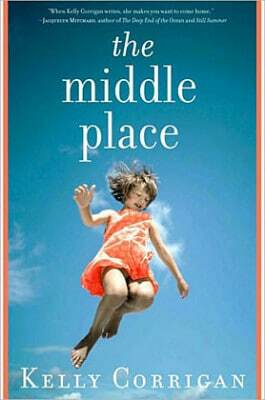 She was living deep within what she calls the Middle Place--'that sliver of time when parenthood and childhood overlap'--comfortably wedged between her adult duties and her parents' care. But Kelly is abruptly shoved into coming-of-age when she finds a lump in her breast. When George, too, learns that he has late-stage cancer, it is Kelly's turn to take care of the man who had always taken care of her--and to show us a woman who finally takes the leap and grows up."